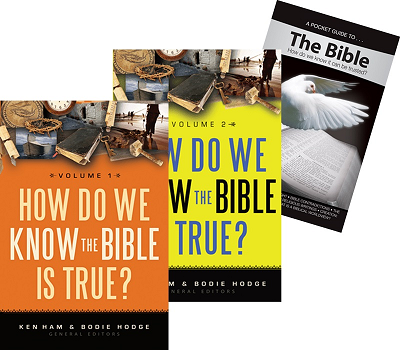 General editors Ken Ham and Bodie Hodge of Answers in Genesis along with a team of biblical scholars and Christian apologists present answers to relevant debates. Get both valuable books! General editors Ken Ham and Bodie Hodge of Answers in Genesis along with a team of biblical scholars and Christian apologists present answers to twenty more relevant debates. Be prepared to give a reason for your faith in God! Can you defend the authority of the Bible? In the growing “biblical authority” debate—which often encompasses the creation-evolution controversy—we usually get a host of questions about science and the Bible. But as soon as we answer those questions (for example in our popular New Answers Book series), skeptics realize their defeat and quickly change their line of attack and go after the Bible itself or the character of God. Over 20 relevant issues discussed. 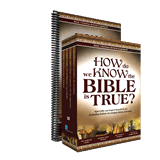 How Do We Know the Bible Is True? is lay-friendly, yet hard hitting where it needs to be. This is an excellent new tool when it comes to defending against the shifting attacks on God’s holy Word. If you were asked how you know the Bible is true, do you have an answer? We are an increasingly skeptical society—whether it comes to politics, science, or even faith. People see conflict everywhere, even about fundamental aspects of the Bible. When church leaders are at odds about biblical truth and scriptural authority, believers are left confused and uncertain, needing clear biblical truth. Addressing topics from popular culture like the Shroud of Turin, or "missing" books of the Bible, and even what makes God’s Word unique among holy books, How Do We Know the Bible Is True? Vol. 2 is a "must have" resource for churches, libraries, and home study.